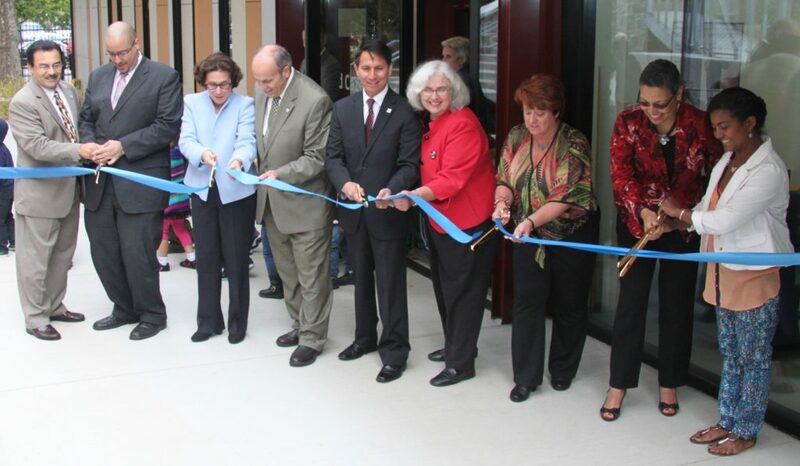 To give more students the opportunity to attend college—by providing convenient child care facilities—dignitaries from across the city and state of New York cut the ribbon on Lehman College’s new Child Care Center. Lehman College and the City University of New York dedicated the Center on Thursday, September 26, 2013, opening new doors for young minds. The new Center accommodates 120 children of Lehman College students, twice the capacity of the previous center. Children participate in a program rich with experiences in art, music, science, language arts, and math, with plenty of room for nurturing individual interests. The philosophy is to create an environment where children’s growth is supported and stimulated while giving their parents the opportunity to complete college. The 12,000 square foot center was designed by Brooklyn-based Garrison Architects and built by Axis Construction. 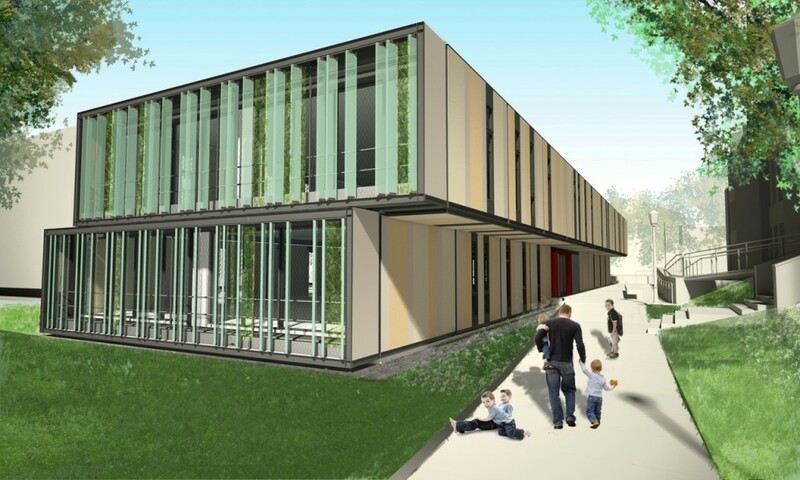 It is a modular facility with six classrooms, a multipurpose room, terraces designed to grow greenery, an atrium with an open stairway, skylights offering a natural ventilation system, and other features. 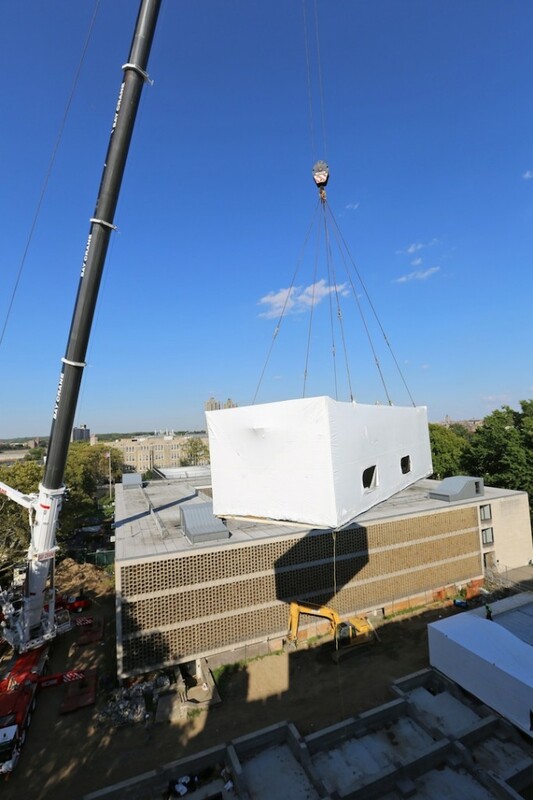 The Center was assembled from 22 prefabricated modules—each weighing 18 tons—and hoisted into place with a 600-ton crane. Click here to learn more about the center’s unique modular construction. The $6.3 million structure was built with funding from New York State capital funds. “Modular design is innovative, it’s creative, and is hitting its strides in New York City,” Ms. Weinshall continued. “We’re so pleased that Lehman was open to using this process. It feels like a perfect fit of timing and opportunity. View or download photos of the construction and ribbon-cutting here. Lehman was one of the first CUNY colleges to open a child care center, in 1971, which moved to a larger facility in 1985.